After Heidi removed herself from the front page recently, she up and decides to add her progress pic once again. The usual conversation went on in the “Fascination With Kimmer” thread at LowCarbFriends. Is it a real pic? Is she really losing weight? Was it photoshopped? At this point, I won’t believe any pic Heidi posts herself. Her track record for falsifying pics speaks volumes. I’m looking for some more concrete proof from an outside source before I believe anything from Heidi. Poor old Heidi showed her true self over at the Kimpire yesterday. This lawsuit and all the Negative Nancies must be really getting to her. As you all know, Heidi has never lost any weight, no matter what she has said in the past. So she is trying to be just “one of the gals” in this latest effort by the whole “Watch Us Lose” on the front page plus that idiotic “Pinky Swear Challenge”. Let’s do some updated pictures…I LOVE to see how good everyone is looking. Kimmer..I know your pics must of changed with your weight loss and Singinglass ..I am so excited that you are in Onderland..great job. Camarodiva and Sally…you look great…any updated pictures? Hey Amy! I sure appreciate your continued interest in how we’re doing on the front page. It wouldn’t be Monday with your post for new pics, right? When new pics & updates are available they’ll be posted OK? Meanwhile, you’re a stone’s throw from goal so get yourself busy and post on all of your challenges! Time’s running out before summer!!! I know if you have time to ask about our pics, you’ve got time to keep up on your challenges. Heidi isn’t losing any weight, y’all. I bet ya dollars to sugar cookies. That’s why she is being so snarky about the pics. She was already called out about the first pic she had up being fake. So she replaced it with the one currently showing. What happened to weekly updates? this challenge has been going on since Nov 12–the day of the M&J show. Yet Heidi has only had 2 pics up. Well I guess I would be snarky too, if I still weighed 350+ pounds and probably gaining when I SAY I weigh only 267. 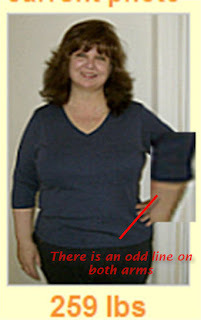 Kinda hard to photoshop 100 lbs out of a pic without someone becoming suspicious. In a recent post, Medusa, talked about Heidi’s affinity for wearing red. A person who likes red can express many personality traits. The positive ones being passion, energy, and money making. The darker manifestations of those who favor reddish-brown colors can be addictions such as drugs, alcohol, eating disorders or emotional instability. Sound like anyone we know?? ?